"Super yummy, mouth watering, fall-off-the-bone ribs! Depending on your slow cooker the time could be less. I have a really old slow cooker and the ribs only take 3 1/2 hours. Just watch and stir every hour and you'll have super yummy ribs! Enjoy!" Preheat oven to 350 degrees F (175 degrees C). Line a large baking pan with aluminum foil and spray with cooking spray. Place ribs onto the prepared baking sheet. Season both sides with grill seasoning. 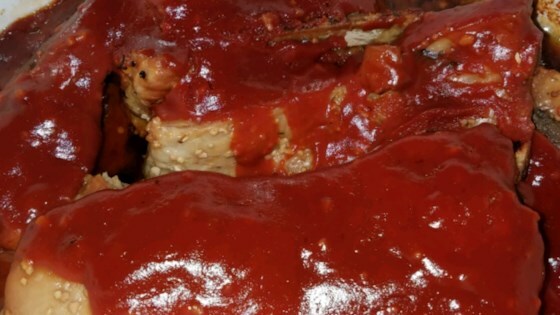 Bake ribs in the preheated oven for 30 minutes; flip ribs over and bake an additional 15 minutes. Cut ribs apart and place into a slow cooker. Mix ketchup, brown sugar, Worcestershire sauce, Dijon mustard, and garlic in a bowl until thoroughly combined; pour sauce over ribs. Stir to coat. Cook ribs on Low until tender, 4 to 6 hours; stir occasionally. See how to make tender, tangy ribs in your slow cooker. Made exactly as it and it’s a family favorite! !